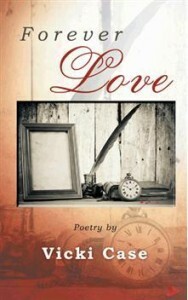 Forever Love by Vicki Case is the fourth of her poetry collections written for Eros, the man she loved and lost. From the very start, reading the background to her emotional journey in the preface of the book my heart went out to her for what she has had to bear, her descriptions here brought me almost to tears, stirring memories and empathy. What follows is poem after poem, almost a stream of consciousness, as Vicki endeavours to let her feelings out and tries to make sense of what happened as she has never found the closure she deserves from an intensely emotional roller coaster from the first careful steps of an affair, taking chances which brought true happiness, only to be followed by a blow so incomprehensibly crushing. As she says herself at the start of the book, “To lose someone you love through death is tragic,” but her experience of callous abandonment without explanation is soul destroying. It must be heartbreaking for her to know that he may still be out there somewhere but without her. I find it so sad that this is her fourth book and yet the hurt still seems so fresh. Within the pages of the poems themselves there is a level of grief that is still very raw, there is love and hate for the same person in equal measure, there is true darkness, anger and loss. From the dangerous words of someone on the verge of suicide through self-loathing to wishing to hurt this Eros as much as his rejection caused her to hurt and even a bleak hopefulness that some day he may return, every emotion is spilled onto the page like teardrops in search of some kind of catharsis that never comes. What the poetry lacks in form and technical skill, it more than makes up for in packing an emotional punch. Whilst I understand that this book is not for everyone, there is a lot in it. If you see past the words themselves and get to the emotional undercurrent, this is a broken person trying to fix herself through letting everything out. It is an emotional read.